Although it may offend delicate sensibilities, flatulence is a fact of life. Everyone passes gas throughout the day to release intestinal gases that build up during the digestive process -- some more than others. The frequency and odor of each individual's gas is as unique as their diet. If you experience gas after drinking protein shakes, one of many underlying factors may be responsible. Consider changing the type of protein shake you use. Many different types of protein are derived from myriad sources. Whey and casein protein are by-products of milk and can cause flatulence if you have a dairy intolerance. Sip the protein shake slowly; don't gulp it down. Swallowing air adds to intestinal air bubbles and will pass as excess flatulence. In addition, drink directly from the cup or shake container -- don't use a straw. Read the ingredient label on the protein shake. People with celiac disease or a sensitivity to gluten may suffer excess flatulence from the gluten in some commercial protein shakes. Try consuming less of the shake at any given time. Intestinal gas is the by-product of digestion -- when the body has to work harder to digest a substance, it may create excess gas. If you add fiber-rich fruit to your protein shake, this could increase bloating and gas. Do Protein Shakes Cause Gas? 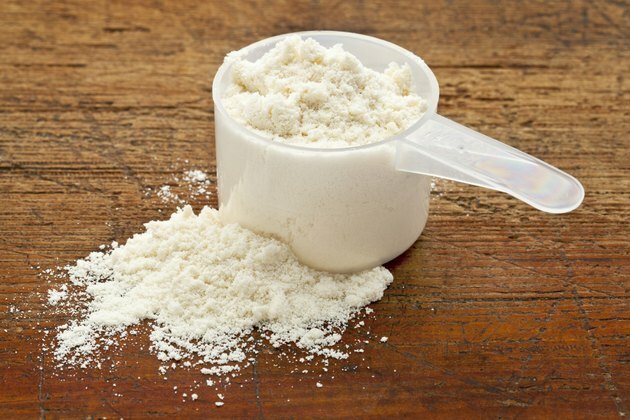 Do Whey Protein Powders Cause Gas & Constipation? Do Fiber One Bars Give You Gas?